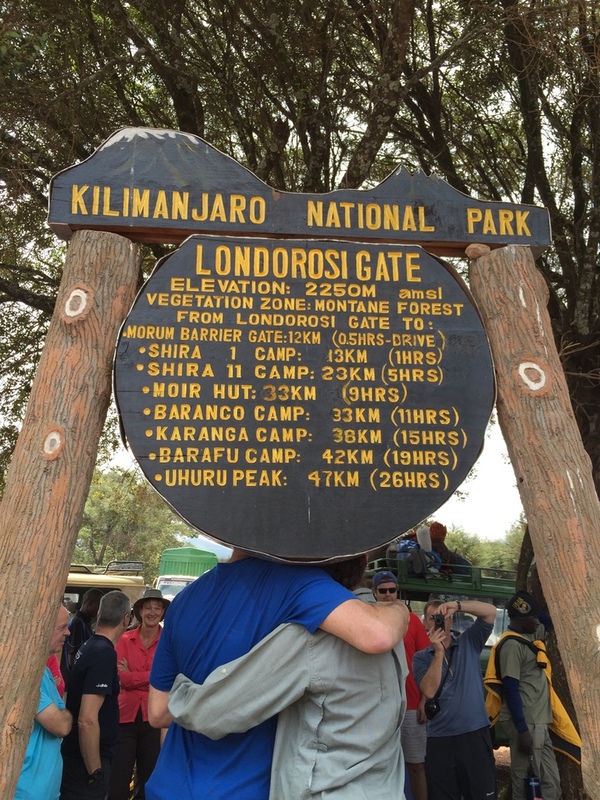 #10 – Kilimanjaro Trek – Sounds Great, Let's Do It! 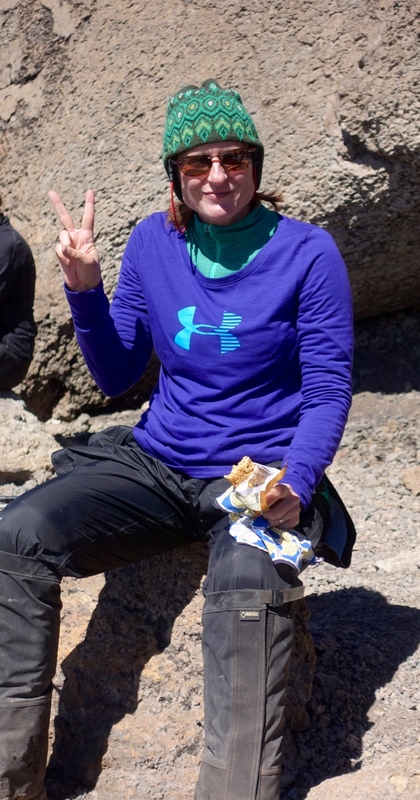 I made it to the summit! 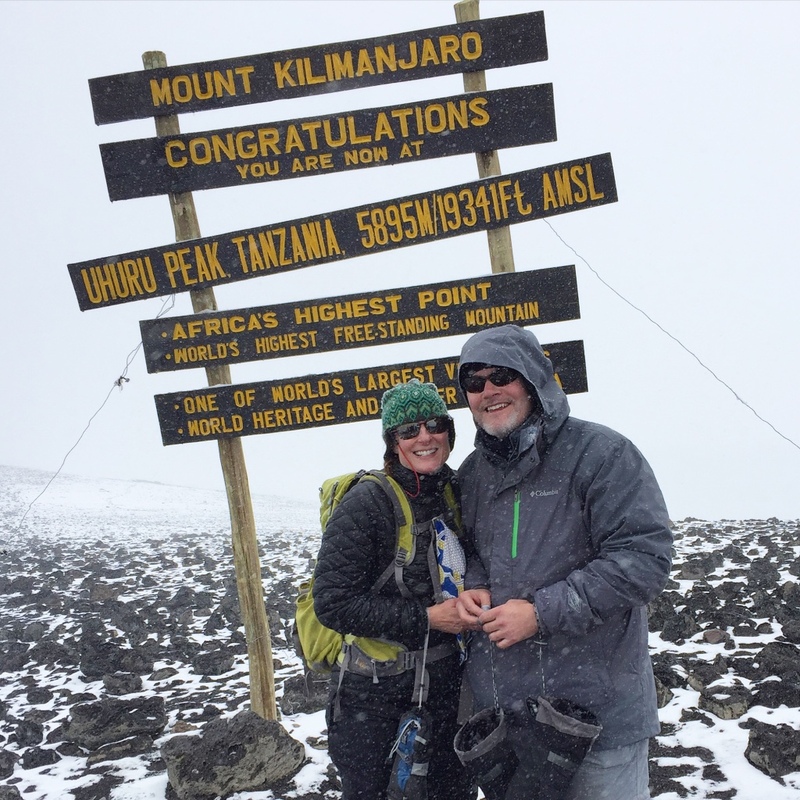 Uhuru Peak – 19,341 feet – the roof of Africa! 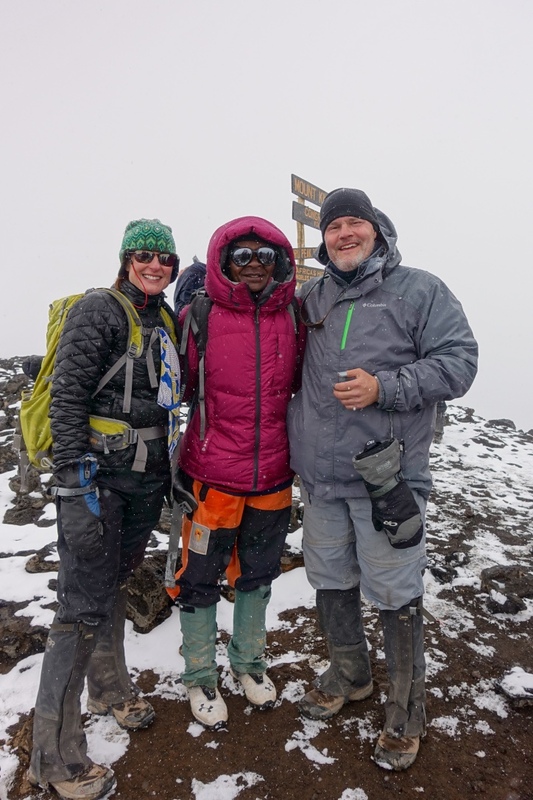 The journey was wonderful – met great people on the trek, learned about the beautiful people of Tanzania, saw gorgeous sunrises and sunsets, hiked above the clouds, and so much more. 1. 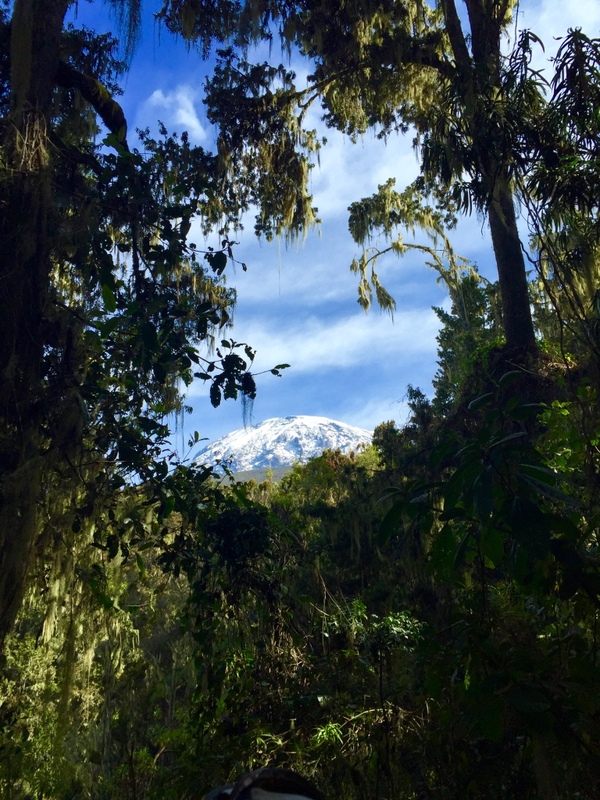 I did a 10-day, maximum acclimatization trek where you hike from the west along the northern face of Kilimanjaro (where you can see down into Kenya) on the least traveled route. 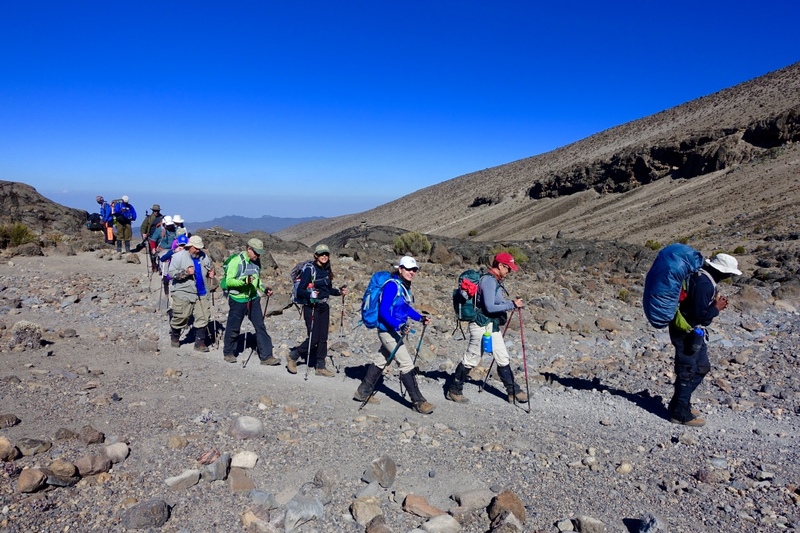 This route is called the northern circuit and has gentler slopes, maximum acclimatization, spectacular views, a daytime summit bid (no waking up at midnight and hiking all night long), and a night at Crater camp – the highest elevation camp on the mountain). 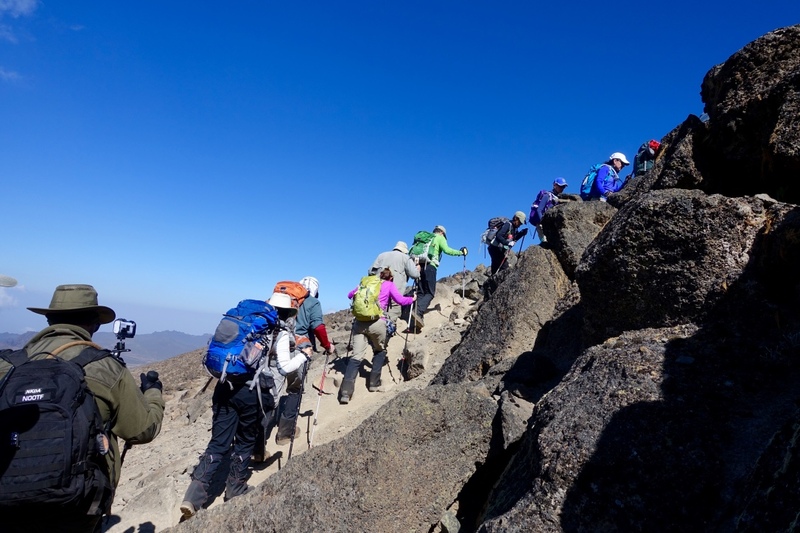 This trek is the most unique way to summit Africa’s highest peak. 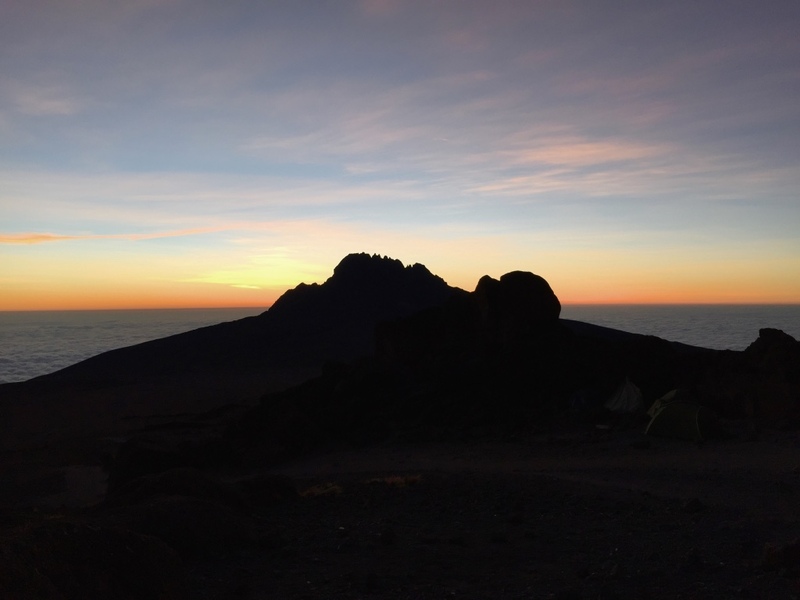 Day/Night 8: Crater camp *This is the day we summited to Uhuru Peak. The route we took allowed us to see Gilman’s Point and Stella Point too. 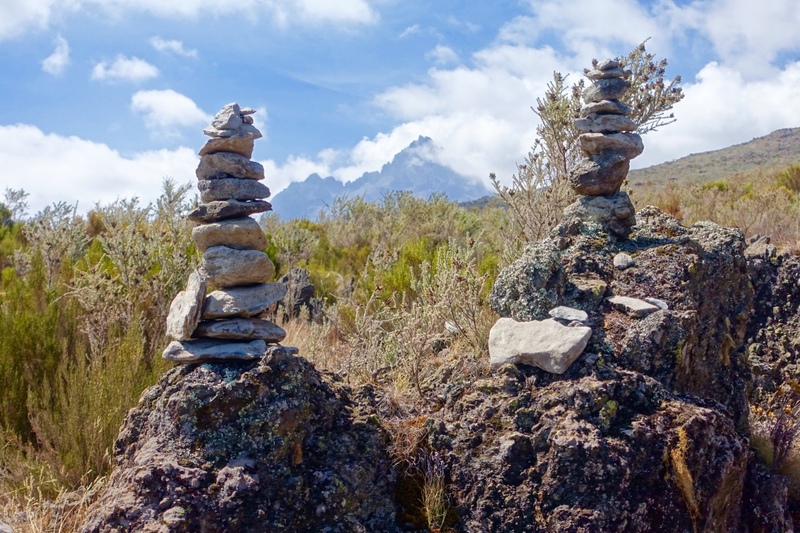 These are 2 other peak points leading up to the highest peak, which is Uhuru Peak at 19,341 ft.
And off to the hotel for a loooong, hot shower!!!!!!!! 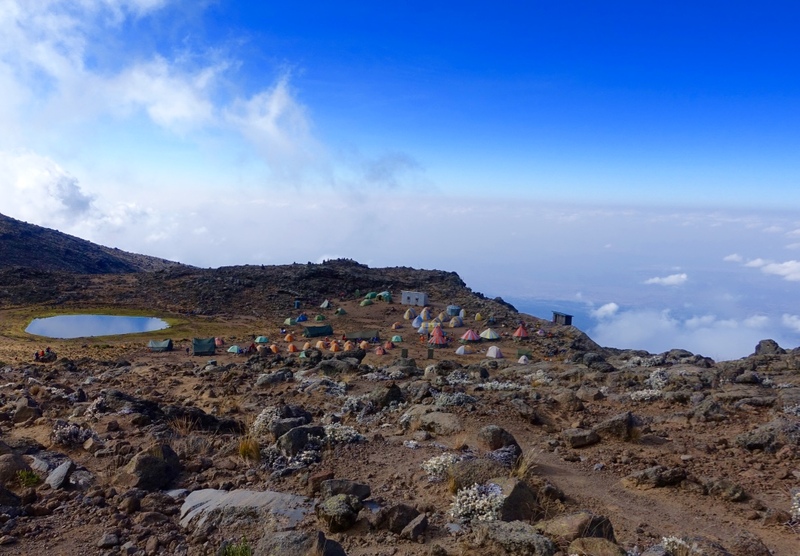 Note: The mileage each day wasn’t bad at all, but as you get above 13,000 feet elevation, the oxygen is less and any physical exertion becomes harder.Sleeping at Crater camp at 18,800 feet was quite an experience. I never had a hard time breathing but my heart beat faster and harder that’s for sure. 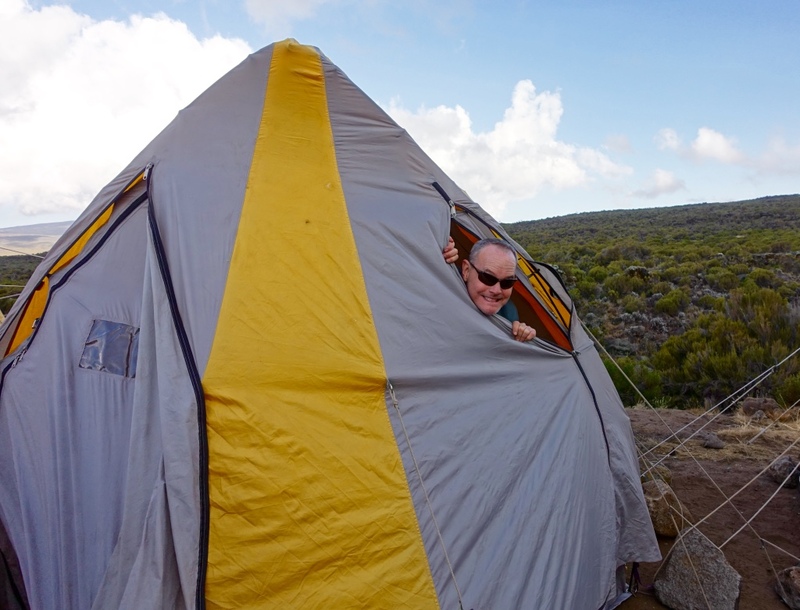 I slept in a tent each night of the trek but they weren’t your average tents. They were walk-in height tents about 7 feet tall, complete with a cot and mattress. As long as the tent was put up on level ground, I slept pretty well in my sleeping bag + fleece liner each night. The trek also included private toilet tents, solar-lit dining tents with tables and chairs, and daily hot basins of water for washing. We had hot meals prepared by the camp’s chef…things like delicious soups at almost every dinner, pasta carbonara, grilled cheese & tomato sandwiches, corn cakes, fruit (mangos, bananas, apples). In the afternoons, we got to camp with our tents set up and sleeping bags laid out on our cot. We often had hot tea and snacks before dinner. 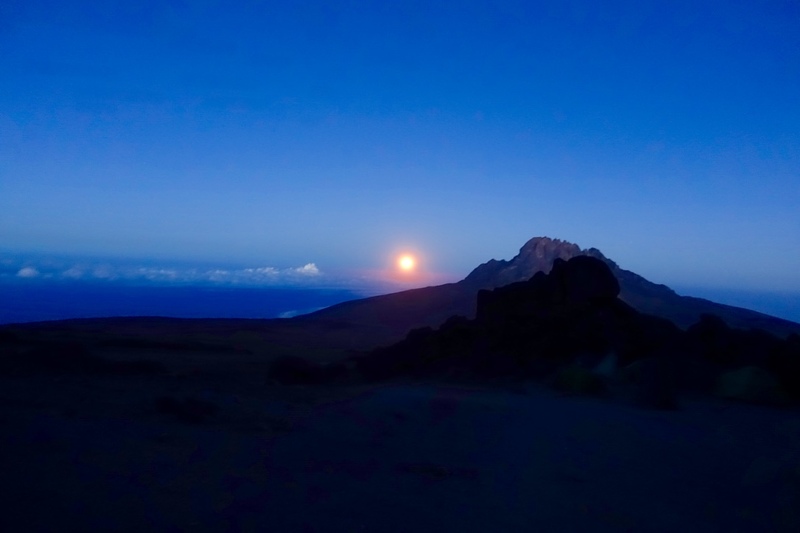 Every night and morning we woke crisp mountain air that was anywhere from about 35 F to – 10 F at Crater Camp. Woot! 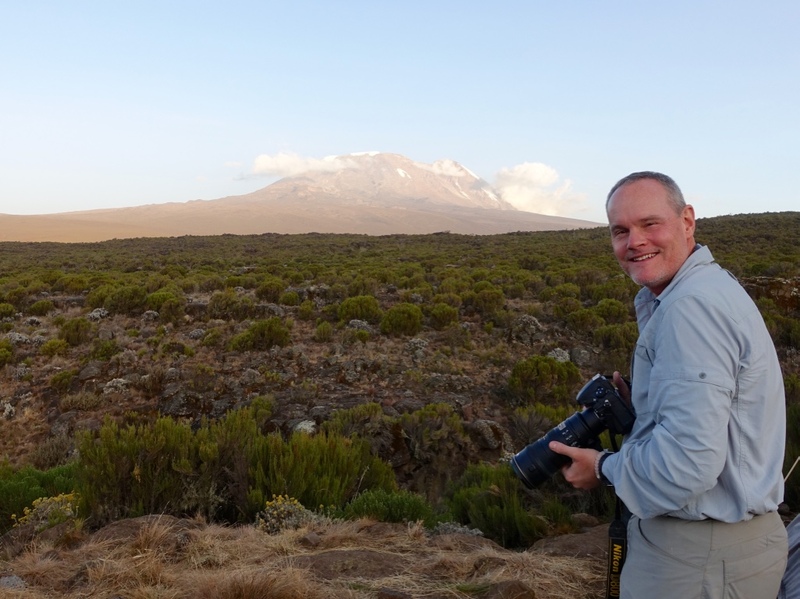 We’re on the roof of Africa! The Porters are the heart and soul of the trek. It wouldn’t be possible without them. This is Matthew, one of our porters, and me. Here’s a view of one of our camps. 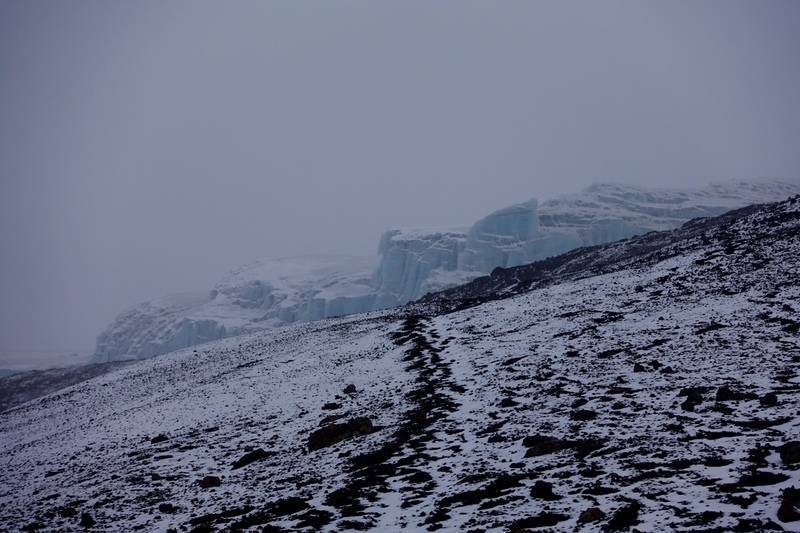 The porters go ahead of us and have camp set up by the time we get there. 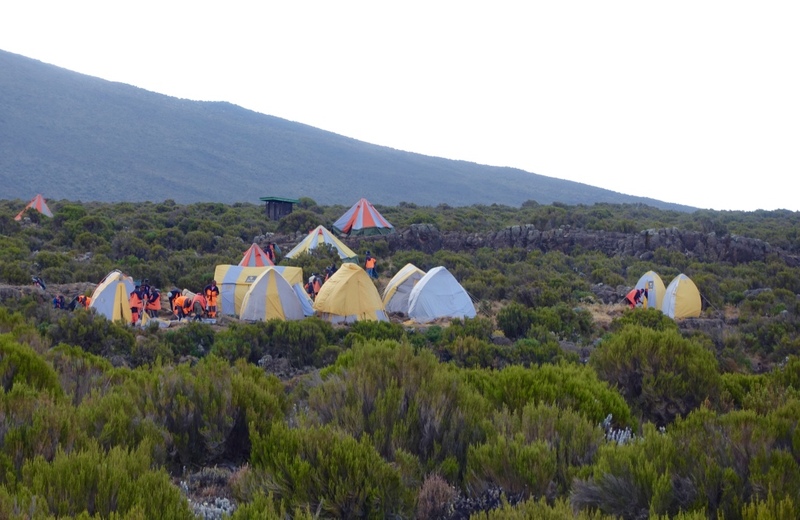 Camp consisted of 6 walk-in tents for the 10 people in the group, 1 dining tent for the 10 of us, 2 private toilet tents, 2 tents for the 4 guides, many tents for the additional 58 porters and cooks. This is early in the trek. 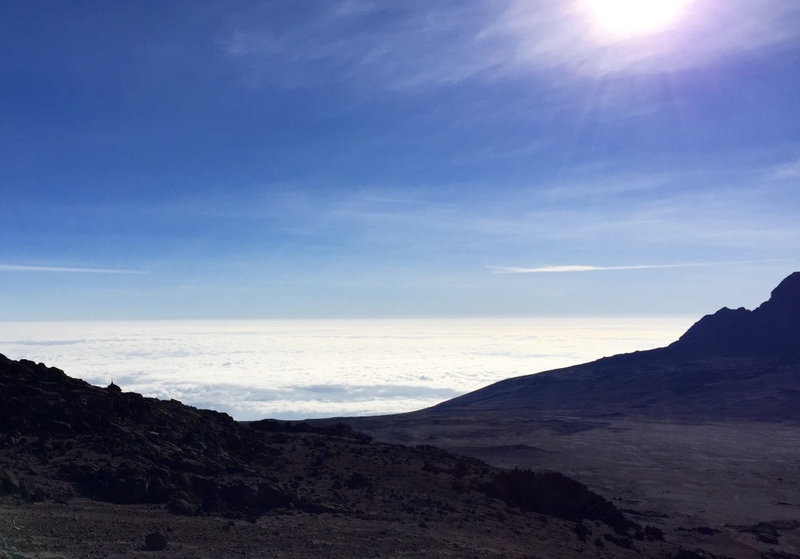 Kili is WAY off in the distance. More photos of the group. Here we come. 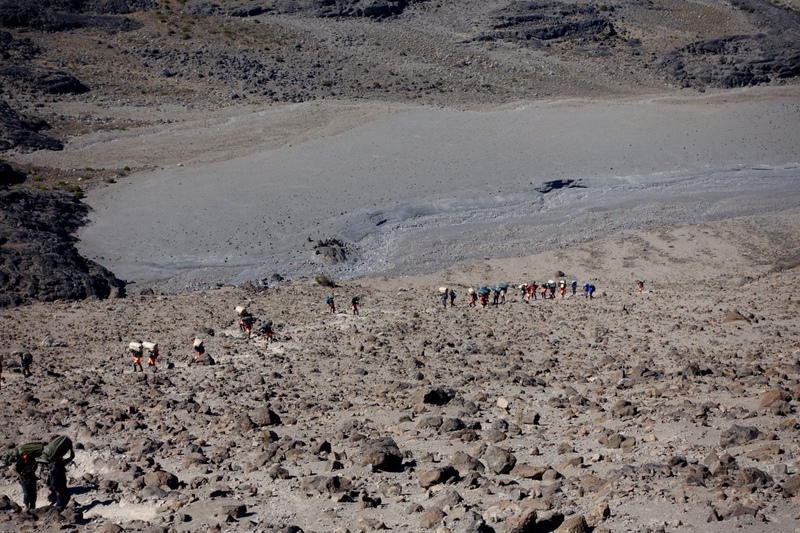 You can see the porters have passed us and are making their way up the mountain. 3 people in the group: Brigitte, Sonia and Denise. Simba, one of the porters is looking on. Kili far in the distance. Most places we camped for the night had a ranger station. If that was the case, we had to officially check in by signing the book. Here is one of our camps. This is day 6, so two days away from summitting. 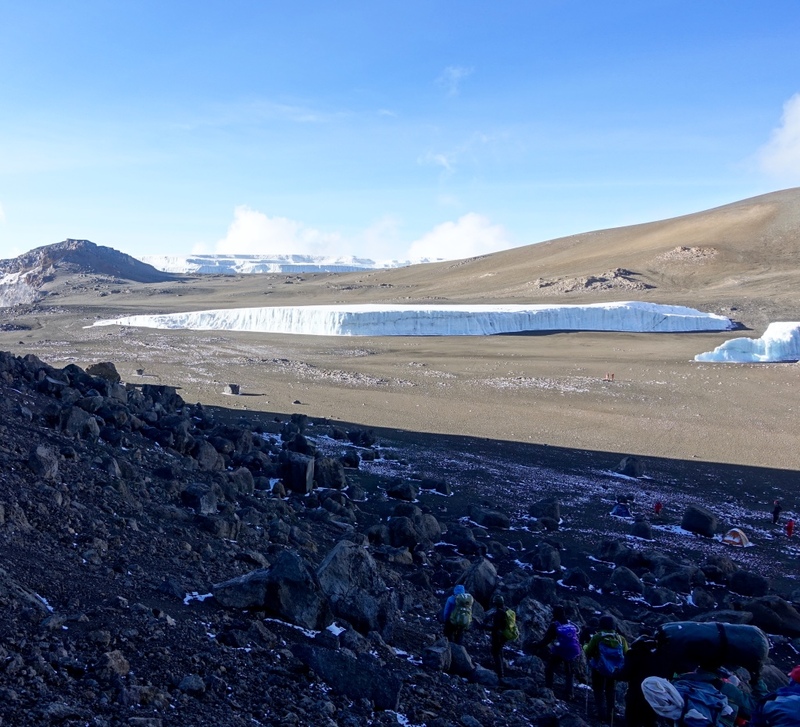 This camp was at 14,200 feet elevation. One of the more beautiful camp locations. 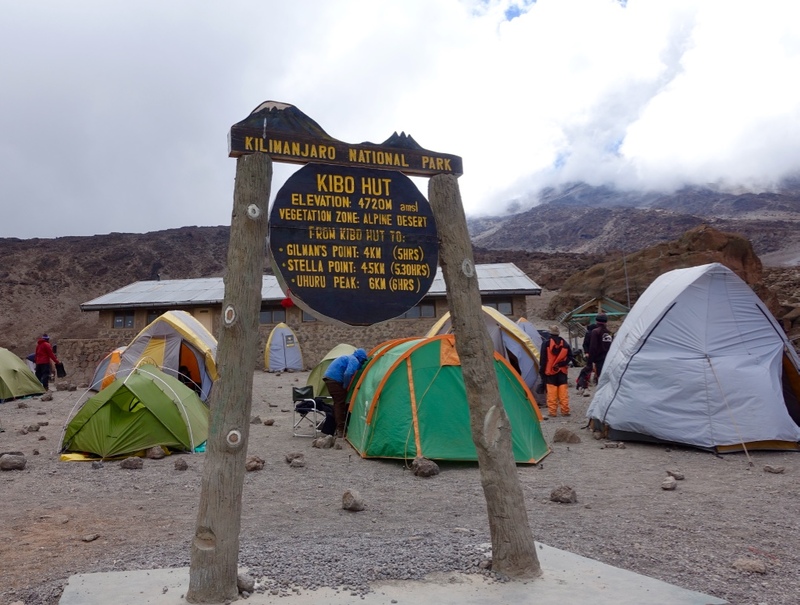 This is Kibo hut – day 7 – the last camp before we summit. This is the dining tent. We ate some great food in this tent! One of my favorite photos. Sunset seen from above the clouds. 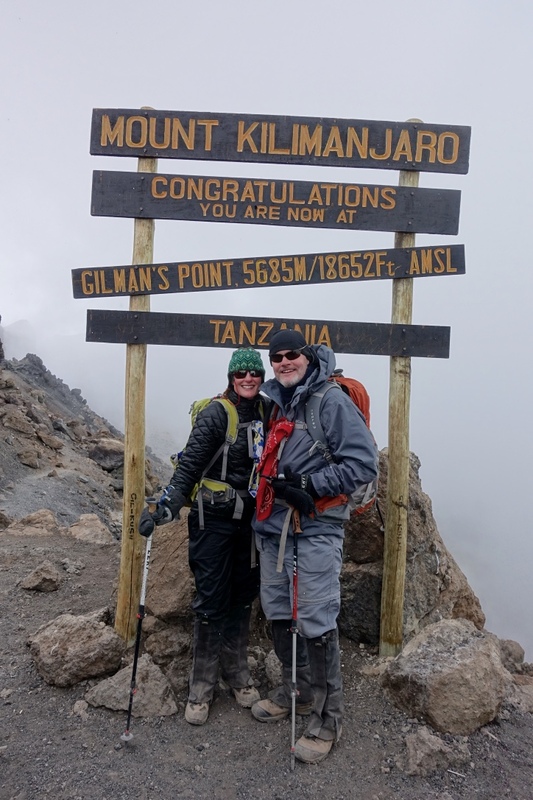 This is the 1st peak we reach: Gilman’s Point at 18,652 feet. 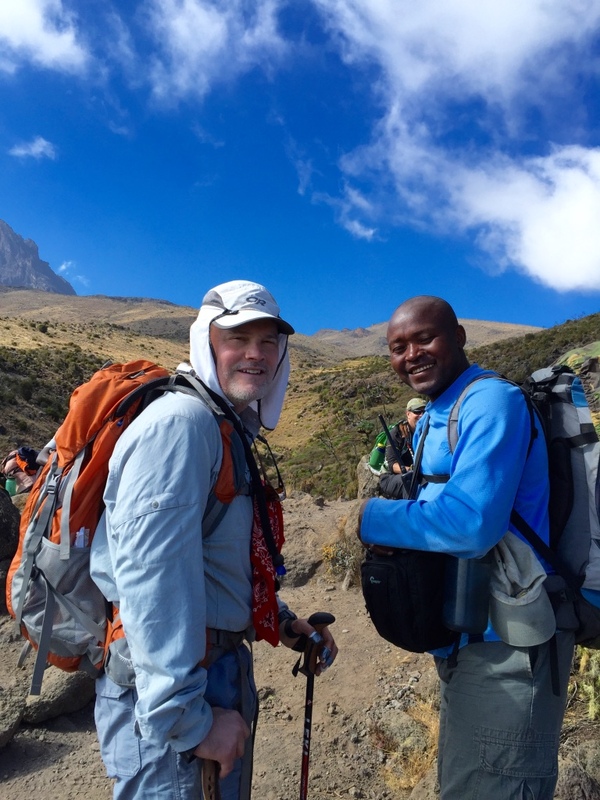 We’re now at the ridge of the caldera and have about 2 hours to go until we reach the tallest peak (Uhuru) at 19,341 feet. We were very emotional here. Soooooo excited to have gotten this far. 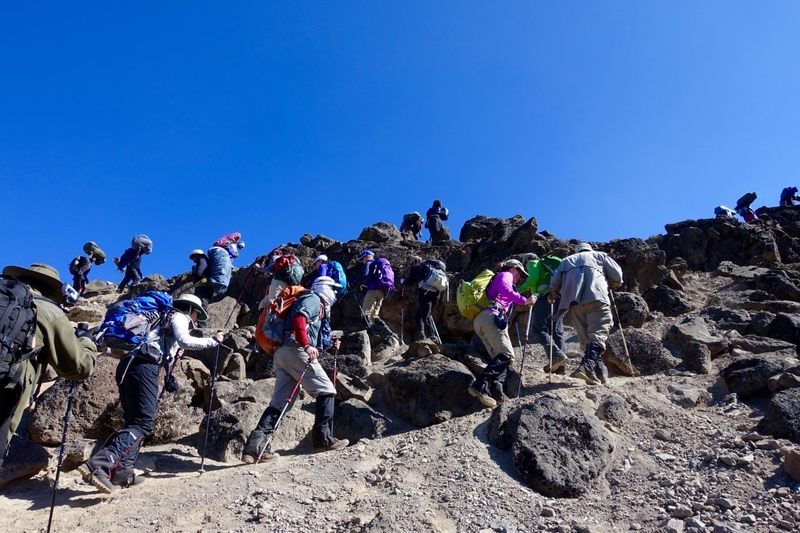 We are now trekking around the rocky landscape of the caledera to the next peak. The snow is still coming down lightly and the clouds are very thick. Here we are at Stella Point. 18,885 feet in elevation. 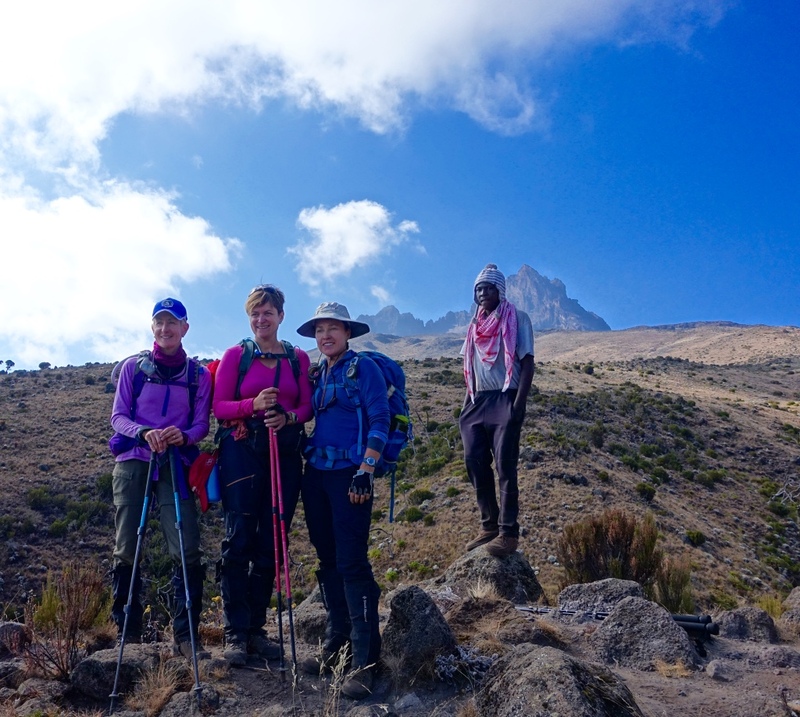 We are so close to Uhuru Peak and are filled with joy. Here’s a good view of the snow that has fallen and the glaciers in the distance. We are at 19,000 feet. Arctic climate zone. It’s about 25 degrees F We made it! 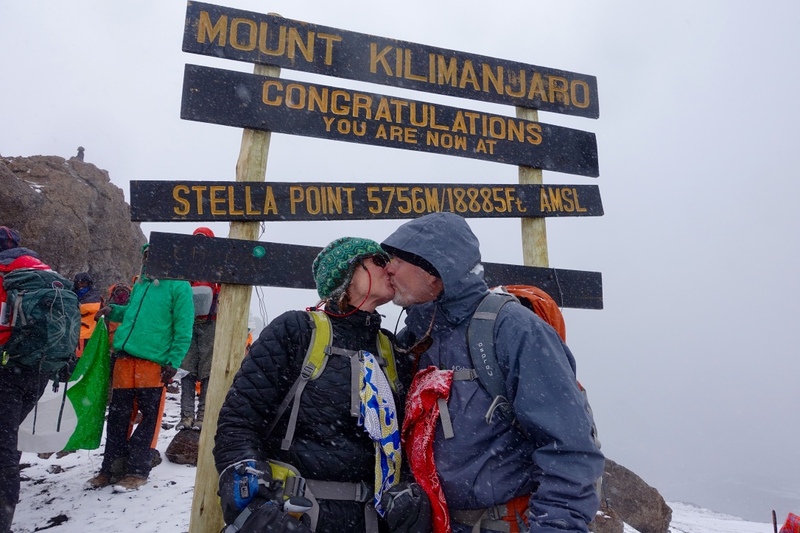 Uhuru Peak. The roof of Africa. 19,341 feet. This was one of the best moments of my life. I worked so hard to get here, physically and mentally, and it felt amazing to accomplish this feat! 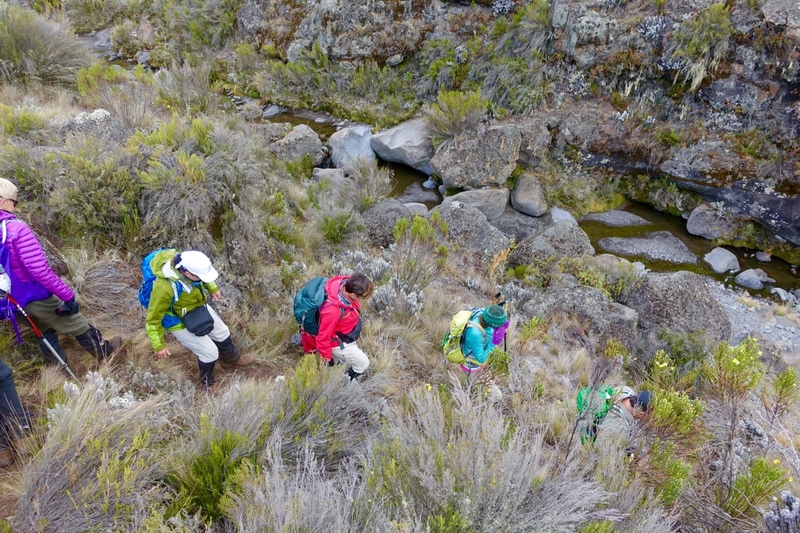 Matthew, one of our porters, in the middle of us. I love this shot of him in his big sunglasses and pink parka! A celebratory shot at the peak! Hiking above the clouds in the snow! It was beautiful up there! Loshe is on the right and Alan, my husband, is on the left. Loshe was one of our assistant guides. We found out that he is in the Masai tribe and has been elected to be Chief of his clan. As I understand it, there are 2 million Masai tribe members and his clan has about 500,000 members. As Chief, he will be part of the Tanzanian parliament. 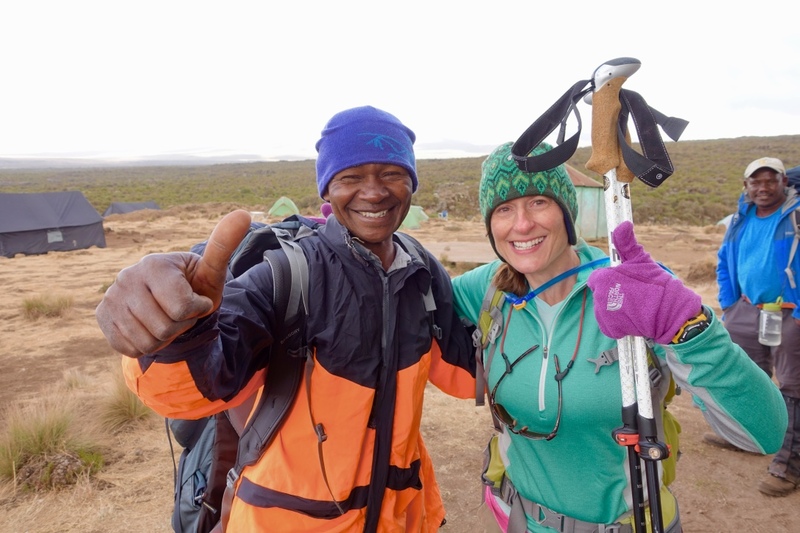 He is a fantastic person and I feel very fortunate to have spent 10 days hiking with him! 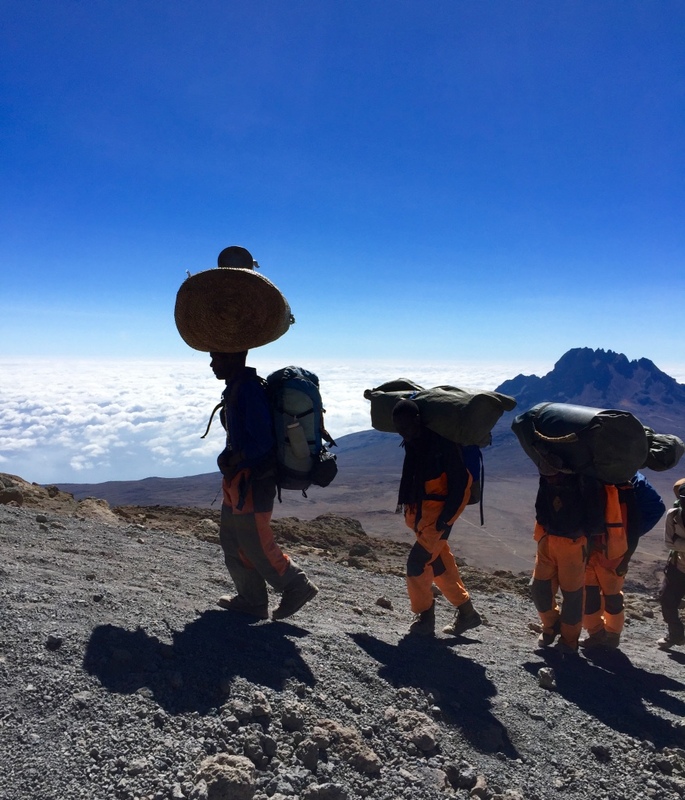 Porters can balance 33 lbs with no problem. 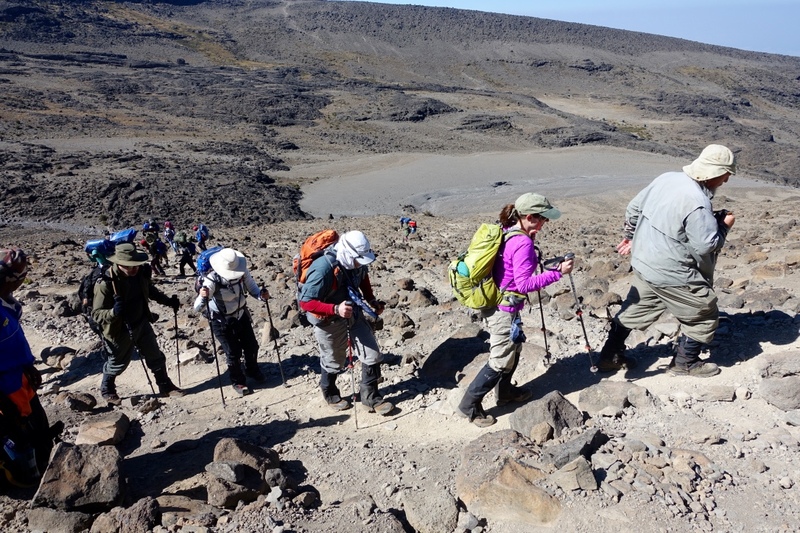 They are a crucial part of the Kilimanjaro experience. Jambo, jambo! 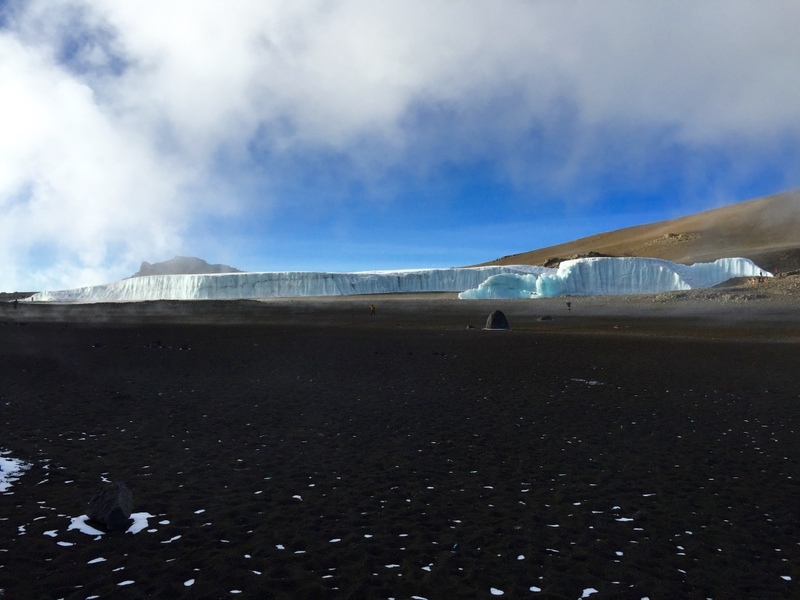 Another shot of a glacier at Crater Camp. This is about 19,000 feet in elevation. Cold! Here we are at the last night on the mountain. We’re had the tipping ceremony and the porters are happy! 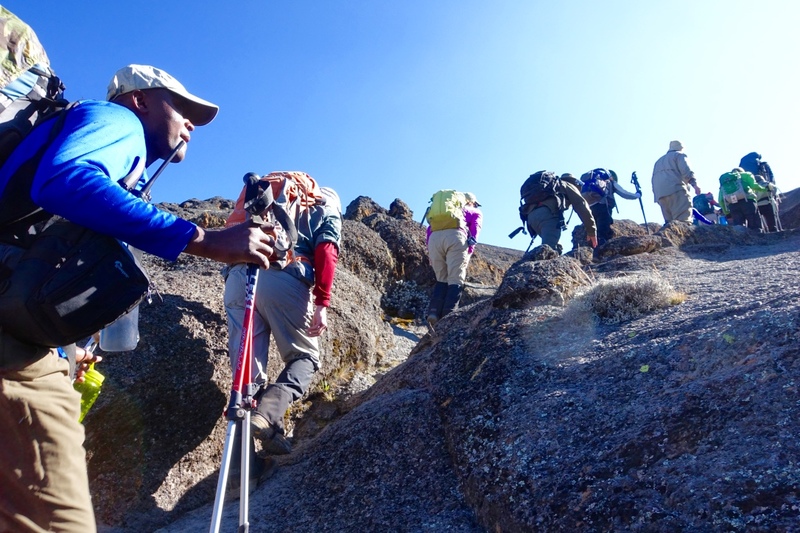 There were 63 guides, cooks, and porters on our trek for just 10 people. 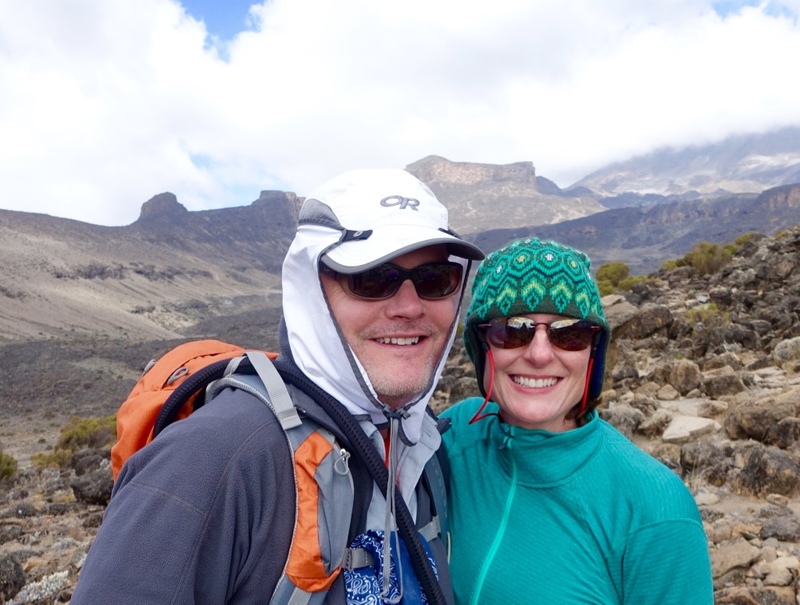 Thomson Safaris / Thomson Treks was an outstanding outfitter and I highly recommend them! 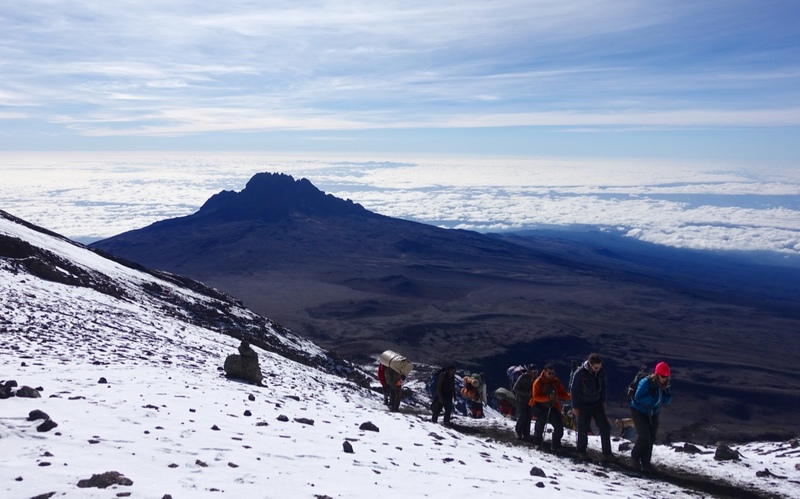 Our last look at Kili. This is day #10 – our last day down. Hard to believe we were at the top of that mountain 2 days prior. 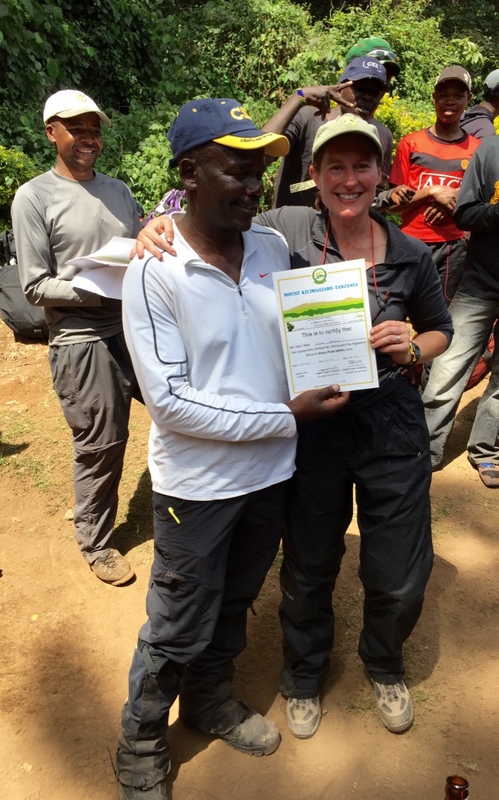 Alan getting his official certificate to say that he made it to Uhuru Peak – 19,341 feet – the roof of Africa! 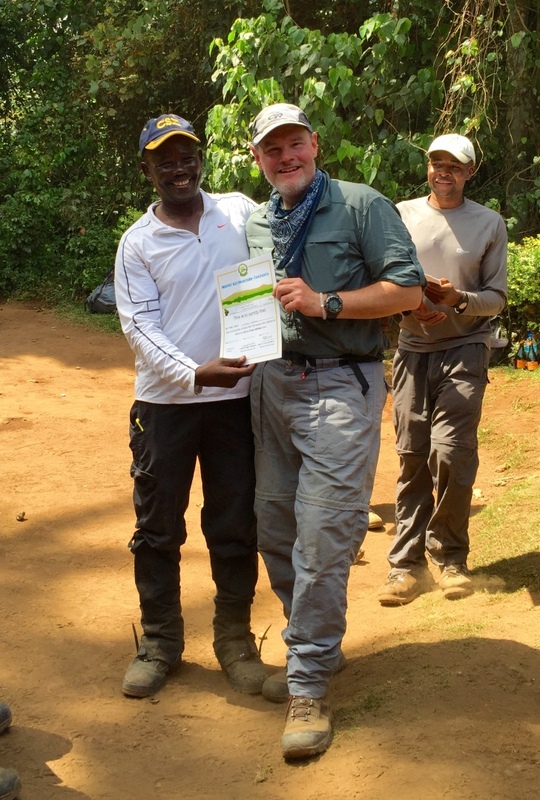 Here I am getting my official certificate to say that I made it to Uhuru Peak – 19,341 feet – the roof of Africa! And here we are at the summit! Woot!!!! Yahoo!!!! That looks like the best trip! Way to go and thanks for sharing all that info! Woohoo!